Here is a Sales dataset of 8 columns and 29 rows. It basically details the revenue earned and cash collected by service type, Customer, Country and Period. For a selected Country and time period, there could be customers availing of both services or of any 1 service. 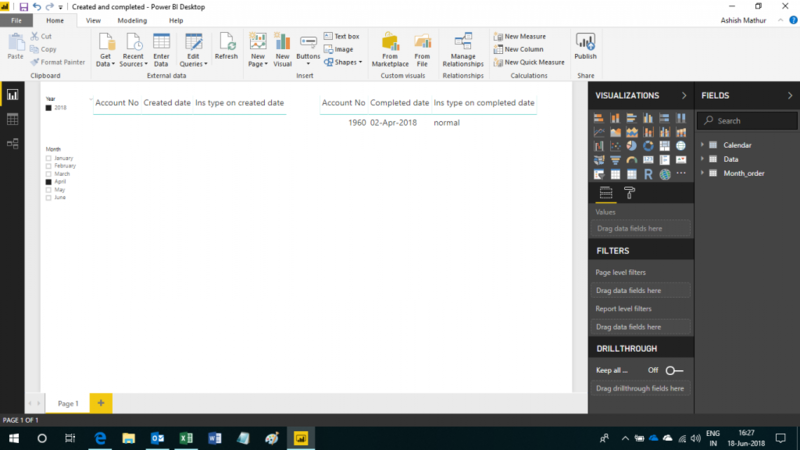 The expected result is shown below in PowerBI desktop software. If you are not concerned with who those customers are (you just want the count), then you may simply remove the Customer Name field from the visual. I have solved this question with the help of the PowerPivot. You may download my PowerBI desktop solution file from here and source Excel workbook from here. 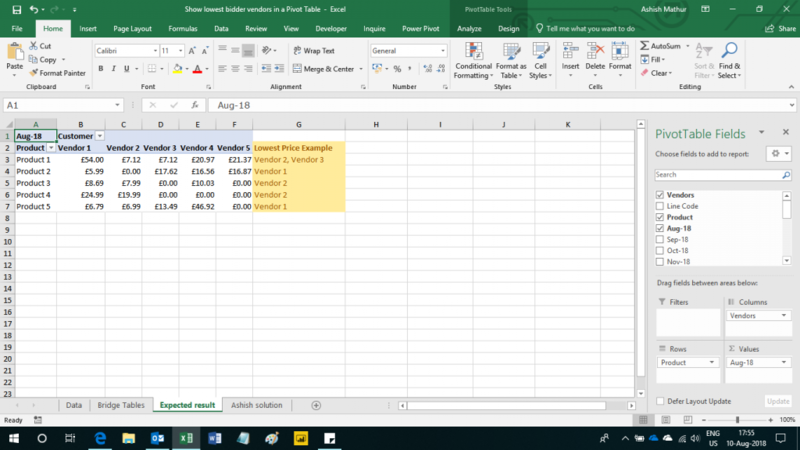 This problem can also be solved in MS Excel using the PowerPivot. Relative size factor (RSF) is a test to identify anomalies where the largest amount for subsets in a given key is outside the norm for those subsets. This test compares the top two amounts for each subset and calculates the RSF for each. 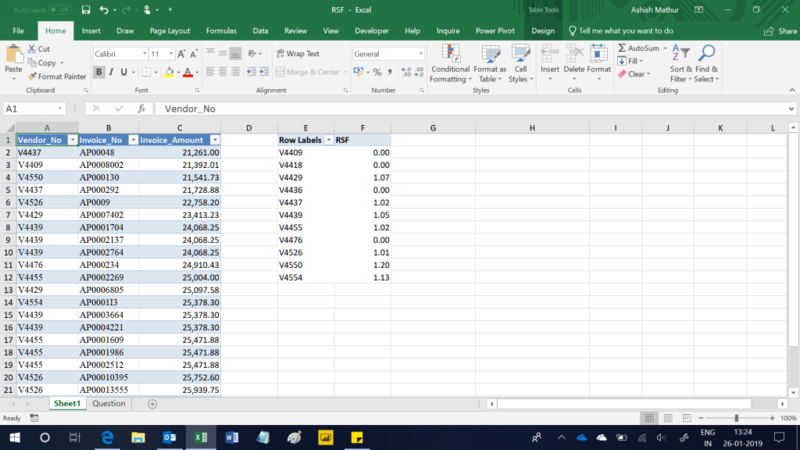 In order to identify potential fraudulent activities in invoice payment data, one utilizes the largest and the second-largest amounts to calculate a ratio based on purchases that are grouped by vendors. You may read more on this topic here. Here is a 3 column dataset. The first column is Vendor Number, the second is Invoice number and last is invoice amount. There can be multiple invoices per vendor. 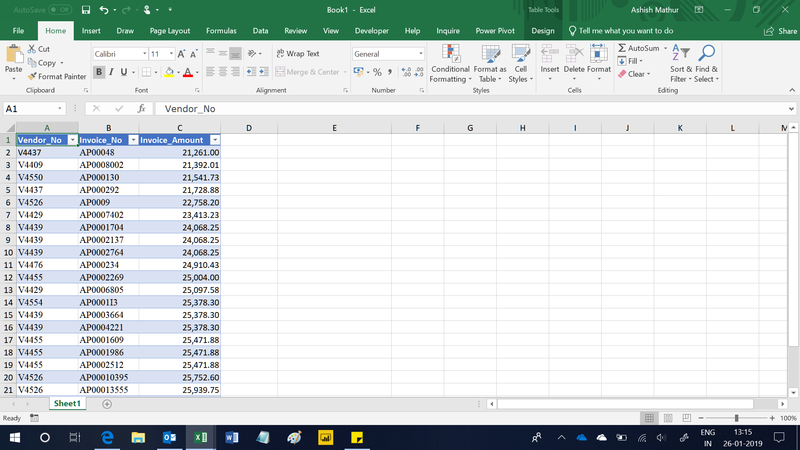 The objective is to determine the highest invoice value for a vendor and divide that by the second highest invoice value for that same vendor to get a ratio. The same needs to be done for all vendors. An interesting case in the dataset below is Vendor_No V4439 - there are 2 instances of highest value for this vendor i.e. 25,378.30 and another 2 instances of second highest value i.e. 24,068.25. The RSF for this case will be 25,378.30/24,068.25. If there is no instance of second highest value for a vendor, then the result should be 0. I have solved this question with the help of the PowerPivot. You may download my solution workbook from here. Imagine a dataset like this. This dataset shows vendors that submitted proposals for supplying various parts to a Company. There is one column for each of the twelve months. Via a simple Pivot Table, one can determine the lowest bidding vendor per product (part) for any chosen month. However, one may also want to know the names of those vendors for each product (as seen in column G below). Notice, that Vendor 2 and Vendor 3 submitted the lowest bid for Product 1 and therefore both names should appear in the result. 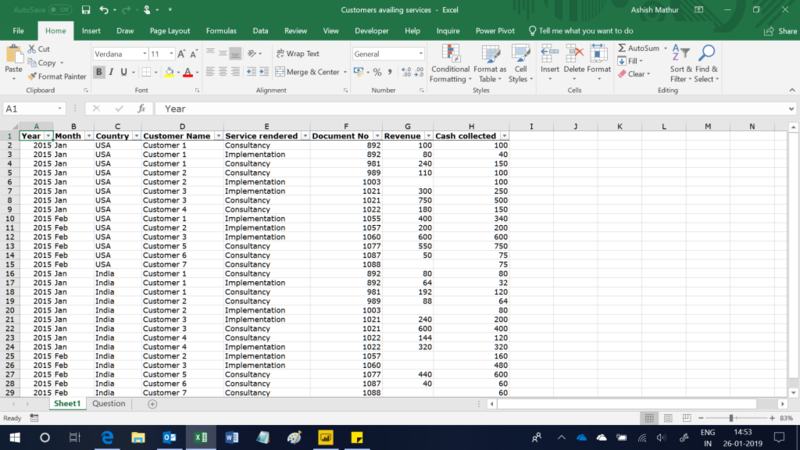 I have solved this problem using PowerPivot and Power Query a.k.a. Data > Get & Transform in Excel 2016. You may download my solution workbook from here. This table contains a list of all the inspections created and completed within different time periods. The objective is to create two Tables from this single table - one showing the Accounts created within the chosen time period and another showing the those that were closed within the same time period. Here are screenshots of the expected results. You may download my PowerBI desktop solution workbook from here. 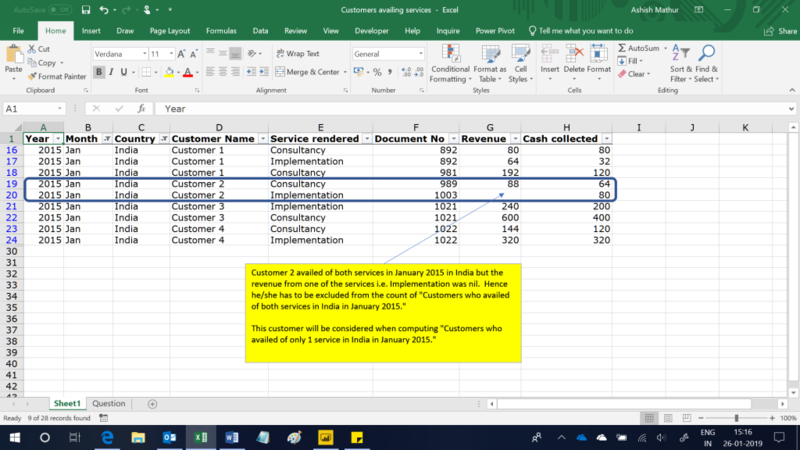 The same solution can be obtained in Excel as well (using Power Query and PowerPivot). As one can observe, for a transaction value of 400,000, the fee has been computed as 3% on the first 100,000 and 2.5% on the next 300,000. You may download my solution workbook from here. 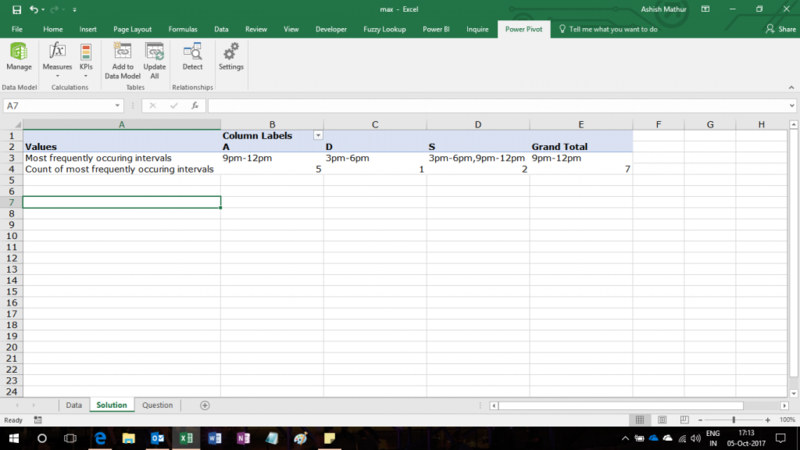 In the file, I have shared 2 solutions - a conventional formula based one and a PowerPivot solution. I have also solved a similar question here. Visualise a 5 column dataset as show below. This is a very small sample of the actual dataset. It shows the date on which supplies were received for each item from Vendors and whether those supplies had errors in them. Finally those identified errors have been bucketed into relevant categories. The Item ID# is a code assigned by the Client Organisation. The format of the ID# is X [Last two digits of year of receipt] [Four digit Number]. For items received from a certain vendor, the last four digits of any item will always be in ascending order of the Date received. In other words. for items received from a certain vendor, the last 4 digits of an item received on 13 January 2017 will always be greater than the last 4 digits of an item received on 11 January 2017 from the same vendor. There will never be repetitions in the Item ID# column. 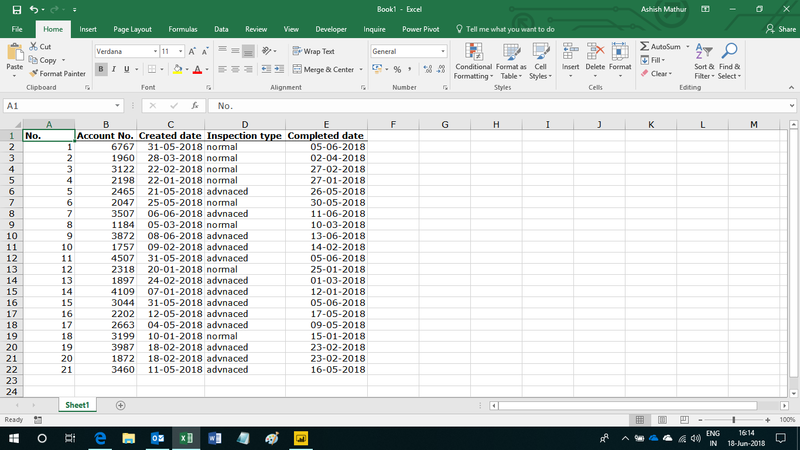 The objective is to compute the error rate by vendor and Error category for the 10 most recent transaction dates with that specific vendor. So, for vendor Name "California" and Error category as "Packing Error", this ratio should be computed as = Number of packing Errors on 10 most recent dates/10. Here is a simple snapshot of the Data for California. I have filtered the dataset where Vendor Name is California and then sorted the Date received column in descending order. Please note that when i filter the dataset on California, a lot more rows are returned. I am only showing the Top 10 rows here because that is what is important for solving this question. I have solved this problem using the PowerPivot. You may download my solution workbook from here. Here's a simple 3 column table showing Date, Project name (Cat.) and Status of the project. Each project can have multiple status entries on different dates. So as you can observe, project "alpha_9383993" was In Progress on Oct 2, 2017, remained so on October 5, 2017 but was completed on October 6, 2017. The result for In Progress should be one because there is only one such project - Oppo_tes_9383. Project alpha_9383993 should not be counted because it was completed on October 6, 2017. Likewise the result for Rework should be one because there is only one such project - Oppo_Max_8977. Project Pulse_9387388 should not be counted because it was completed on October 7,2017. I have solved this problem with the PowerPivot. You may download my solution workbook from here. 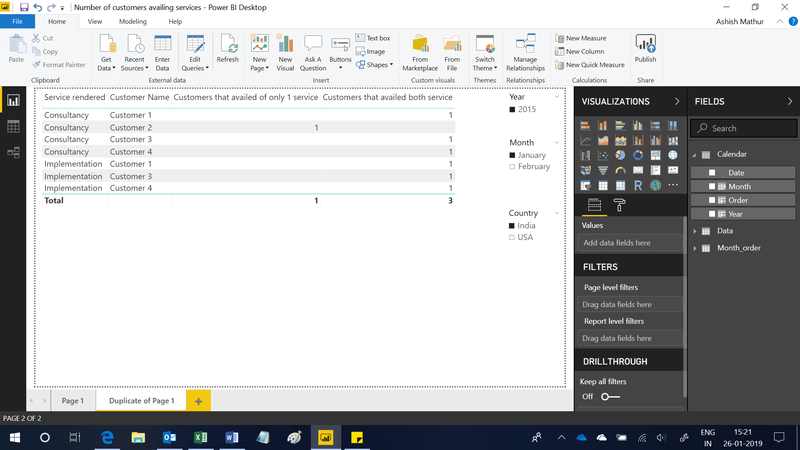 Here's a simple dataset showing the Date of sale, Customer Name and Sales amount. So, for A, revenue earned on March 12, 2017 is 6 and on March 13, 2017 is 2. 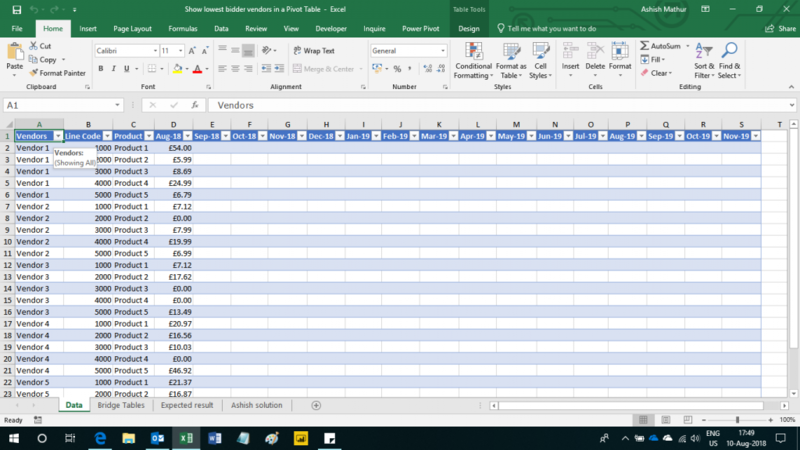 Since the higher of the two is 6, that is the result which should appear in the Pivot Table.